The Maids, one of the top Greensboro cleaning services: eco-friendly tips. You’ve surely heard the warnings about the chemicals that exist in common household cleaning products. Lately, we are wising up to the fact that harsh chemicals, while they may power through tough grime, are not necessarily healthy for us or the environment. Even cleaning services in Greensboro use eco-friendly cleaning products in customers’ homes. If you’re not already, consider switching to natural cleaning products for all the benefits they offer. And while you’re considering new cleaning options, ponder the benefits of hiring house cleaning services. Won’t Harm the Environment. The top benefit of natural cleaning products is that they won’t do any harm to the Earth. They don’t pollute water, they don’t release harmful gasses into the atmosphere, and they don’t disrupt the ecosystem. Safe for your Family. Harsh chemicals can cause respiratory irritation, and those who suffer from asthma or allergies can be affected much more severely by cleaning products that contain things like ammonia, bleach, and perfumes. Over time exposure to such chemicals can be harmful. Some common household cleaning products have even been linked to cancer in some studies. Safe for your Pets. Sometimes pets lick things and drink from the toilet. If you’re using harsh chemicals, they can be poisonous to pets. Natural cleaning products will help keep your pets safe and healthy. Cleaning is More Pleasant. Whoever is doing the cleaning will find the task much more enjoyable without the strong-smelling chemicals that can burn your nose and eyes and even cause dizziness. Get double the benefits of eco-friendly cleaning products when you hire cleaning services in Greensboro that use safe cleaners. Less Hassle. There may be a few people out there who enjoy cleaning, but most of us would rather leave it to someone else. More Personal Time. When you don’t have to clean, you have more time for yourself to do the things you enjoy. More Time with Family. Spend more time with the people that matter. If you work all week and don’t have time to clean, you could end up spending your whole weekend doing the cleaning instead and missing out on fun family time. A Deeper Clean. As diligent of a cleaner as you may be, professionals make it their job to clean thoroughly. Save Money. 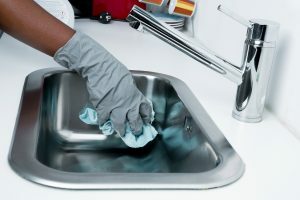 Think you can’t afford the price of cleaning services in Greensboro? It’s actually much more affordable than you think. You can reduce the cost of cleaning products in your budget. And for many people, time is money. If you have the kind of career that pays you based on how much you get done, you can earn more money with more time to focus on your job. If you want to experience all the benefits of professional cleaning services and eco-friendly cleaning products, hire The Maids of the Triad. The Maids 22-Step Deep Cleaning System leaves your home clean, fresh, and safe. Call today for a free estimate: (336) 292-7805.